Billing Chimneys has been invited to be involved in many restoration projects where the building has been listed and a conservation officer has been appointed. 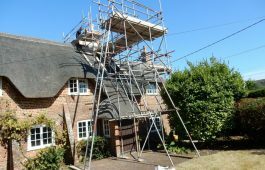 Whether a Grade 1 listed Palladian country house or a more modest thatched country cottage, the company has a sensitivity to the requirements of all concerned. Whilst some building works will inevitably disturb the original fabric of the building, Billing Chimneys’ tradesmen are all skilled in the use of traditional materials and building techniques so that the new works are consistent with and matching to the original. During the process of achieving final permissions the company has frequently met on site with the owners, building company, planners and conservation officers. With years of similar work behind the company, our personnel can speak with authority on the suggested methods, the impact on the building and the authenticity of the work undertaken. With so many methods of flue lining available and each one advertised as the best, it is essential to receive an unbiased opinion from someone who considers the building as a whole and what will suit that structure in the long term. Whether the client is seeking a return to the original function of the fireplaces and this is at cross purposes with the safety and efficiency of the flue, or they are considering overhauling or replacing the fireplaces then Billing Chimneys can illustrate all the options together with alternative suggestions if either the building’s structure or the development budget will not allow the original vision to be realised. The flues and chimneys in larger old houses often become redundant, however, this does not mean that they have no further use. Whether the client is interested in specialised air systems or as a route for data transfer or other cabling requirements the chimneys and flues are an insitu conduit providing much scope for the new application. Billing Chimneys can survey the flues to discover the route and dimensions as well as their condition and suitability for the proposed use. Older neglected houses as well as those that have seen continuing building work can have their flues encroached upon or simply blocked by bird nesting material and other matter. It is not unusual for redundant flues to have been used as rubbish chutes in the past with the last of the rubble left in the flue to set with later bird activity. Whatever the condition of the flues Billing Chimneys can access and survey the flues, on occasions, with the conservation people on side, openings in chimney breasts may be required to remove the blockage and again the Billing Chimneys’ tradesmen can make good using traditional suitable materials. As with all our suggestions we do encourage the architect, surveyor or other building professional to request our input early on. Flues are a traditional part of the structure but they still need to be taken seriously and given early consideration along with all the other services that the building will rely on. The rules and regulations regarding solid fuel appliances and open fires within thatch properties can appear to be vast and daunting on first reading, resulting in a home owner perhaps becoming uneasy as to the quantity of works, the cost implications an installation may have and also the insurability of the property.